Greater Palm Springs, California has been widely recognized as a “wellness destination” for more than a century, drawing people from across the country for its sunny, dry climate and curative hot waters. During the Golden Age of Hollywood, scores of screen stars flocked to this famed Southern California getaway to rejuvenate and socialize poolside. Today, travelers around the world over visit Greater Palm Springs where bountiful sunshine, breathtaking scenery, effervescent mineral springs, and a myriad of health and wellness amenities invite a visceral sense of well-being. Just a 2.5-hour drive from Los Angeles and San Diego, yet a world apart from the hectic pace of urban life, Greater Palm Springs encompasses nine resort cities—Desert Hot Springs, Palm Springs, Cathedral City, Rancho Mirage, Palm Desert, Indian Wells, La Quinta, Indio and Coachella—each with its own unique flavor and amenities. The region’s subtropical desert climate, with more than 300 sunny days a year, encourages guests and locals to stay active and fit. And, for those seeking outdoor adventure, Greater Palm Springs is a genuine paradise. 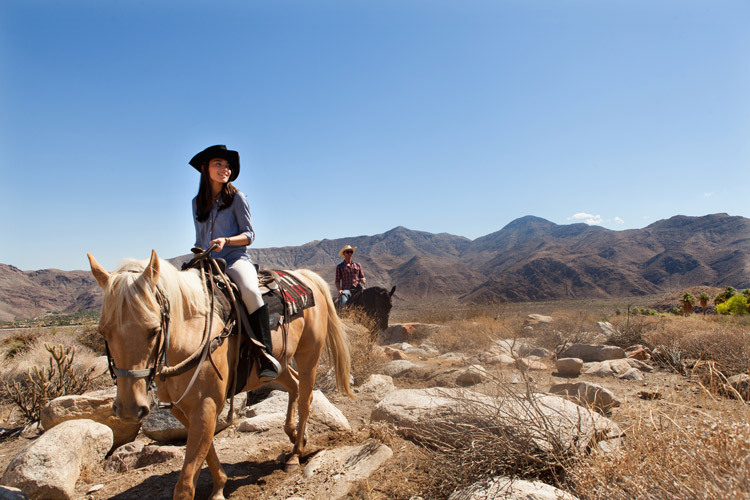 More than 1,000 miles of scenic trails weave through the Indian Canyons, Santa Rosa and San Jacinto National Monument, plus there are several more parks and preserves where nature enthusiasts can hike, bike, ride horses, and see the sights via guided jeep tours. 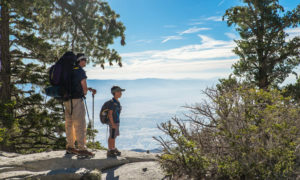 The Palm Springs Aerial Tramway, one of the area’s major attractions, is an adventure not to be missed with slowly rotating tramcars that carry riders on an exhilarating journey 2.5 miles from the desert floor to the alpine wonderland of Mount San Jacinto State Park. The Living Desert Zoo & Botanical Gardens delights people of all ages. Hundreds of animals and plants populate the 1,200-acre park, which is committed to the conservation of the desert ecosystem. Greater Palm Springs is also the ideal base for an excursion to Joshua Tree National Park, one of the most picturesque national parks in the U.S. with its starkly beautiful landscape and fascinating rock formations. The region’s rich agricultural bounty ensures an authentic farm-to-table experience at restaurants throughout Greater Palm Springs. From award-winning fine dining to casual bistros and ethnic-inspired eateries, culinary standards are high. To savor a grand taste of the desert, clients might want to visit in June when the annual Greater Palm Springs Restaurant Week features more than 100 participating restaurants offering specially priced lunch and dinner menus. Likewise, Greater Palm Springs is a leader in sustainability initiatives and is in the forefront of water conservation programs and renewable energy development and use. Many solar energy farms operate throughout the region, along with iconic wind farms and thousands of towering white turbines stretching along the San Gorgonio Pass. For sports enthusiasts, Greater Palm Springs boasts more than 100 championship golf courses, hosting everyone from amateurs to pros to presidents. Winter season brings exciting equestrian polo with matches played in a breathtaking setting surrounded by mountains. In March, more than 450,000 tennis fans converge at the Indian Wells Tennis Garden for the annual BNP Paribas Open, which will be held March 9­–22, 2020. The prestigious tournament, now the fifth largest professional tennis event in the world, brings the top-ranked WTA and ATP players to Greater Palm Springs for two weeks of thrilling competition. The 88-acre, state-of-the-art tennis facility also plays host to the Margaritaville USA Pickleball National Championships in November. What does the destination offer for the wellness-minded? Greater Palm Springs features an array of wellness retreats and programs as well as destination spas, day spas and medical spas. For decades, wellness devotees have escaped to Desert Hot Springs, a veritable spa city atop an underground aquifer brimming with hot mineral water. Today, nearly a dozen spa resorts tap into the therapeutic water known for its healing properties. For instance, within the private setting of the 72-acre Two Bunch Palms Resort & Spa, guests can take a complete digital detox, soaking for hours in The Grotto’s mineral pool, surrendering to spa treatments, slipping into a mud bath or sound bath, and savoring healthy dishes in the resort’s restaurant, Essence. More intimate properties that cater to balneotherapy include The Spring Resort & Spa, El Morocco Inn & Spa, Lido Palms Resort & Spa, and Tuscan Springs Resort & Spa. The world-class spa resorts spread throughout Greater Palm Springs offer a wide selection of holistic treatments and alternative therapies, as well as many signature skin treatments using indigenous ingredients such as date sugar, sage, and citrus. Throughout the destination, guests will find a vast range of programs and facilities, from floatation centers and meditation retreats to functional wellness and nutrition programs, bodywork, yoga studios, and more. Greater Palm Springs celebrates the wellness lifestyle all year, but even more so in the fall when Wanderlust Wellspring arrives in Palm Springs—this year held on October 4­­–6, 2019. Now in its second year in the destination, this premier wellness gathering features renowned speakers in the field, yoga, meditation, an expo, and variety of interactive sessions, all focused on helping participants achieve a state of multifaceted health and wellbeing. With its enviable setting and diverse terrain, Greater Palm Springs serves as the site for a number of competitive, single- or multi-sport endurance events. Now in its 34th year, the Annual Tram Road Challenge 6K Run/Walk (October 26) brings athletes from around the world for this unique event. The course heads directly in the face of Mount San Jacinto with a vertical climb of 2,000 ft. in just over 3.7 miles. The much-anticipated Ironman 70.3 Indian Wells/La Quinta premiered in 2018 and will return on December 8. Riders of all levels can participate in The 22nd Annual Tour De Palm Springs (February 7–8, 2020). The charity cycling event features course lengths at 9, 26, 51 and 102 miles. The calendar of competitive and/or endurance fitness events also includes The Patriot Ride (October 18–19), New Balance Palm Desert Half Marathon & 5K (February 2020), Desert Triathlon (March 2020), and several smaller races throughout the year. What type of visitors does Greater Palm Springs attract? Why recommend this destination to your clients? Greater Palm Springs boasts a year-round population of 500,000 that swells to roughly 800,000 during the winter months. 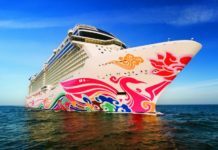 The destination welcomes visitors of all ages and interests, and is a popular travel choice for LGBTQ singles and couples. In high season, Greater Palm Springs enjoys an influx of visitors from wintry U.S. and Canadian cities, attracted to this sunny destination for its array of activities, attractions, special events, and wellness amenities. Greater Palm Springs travelers seek the ultimate leisure experience and many are repeat visitors. College educated couples for the most part value the wide spectrum of outdoor recreational activities such as golf, tennis and hiking, as well as dining, entertainment and shopping options. In the spring, and particularly April, two consecutive Coachella weekends are followed by Stagecoach, which are a major draw for Millennial travelers. European travelers often visit Greater Palm Springs during summer months, enticed by the balmy weather, value-added resort packages, and dining specials. From towering mountains to unspoiled palm-fringed canyons, sun-drenched days and night skies candescent with stars, Greater Palm Springs’ gorgeous setting, outdoor sporting activities and adventure, cultural offerings, dining, shopping, spas and relaxed pace appeal to clients who wish to unwind, stay active outdoors, experience the cultural landscape, or take in a combination of all three. With more than 300 days of sunshine and an average annual temperature of 74F, Greater Palm Springs is the perfect destination to visit all year. Temperatures in July–September can exceed 100F, so visitors and locals can enjoy the array of indoor attraction during the midday hours. For more information on Greater Palm Springs, California, VisitGreaterPalmSprings.com.